If you’ve ever had a hard drive fail you understand the pain of losing your important data. There are many ways a hard drive can fail, but here we will focus on hard drives that overheat. Learn what causes hard drives to overheat and how you can prevent it so you never lose your important data. Hard Drives Heating Up: What Does it Mean? When hard drives begin to heat up and grow hot to the touch it isn’t just inconvenient—it’s usually a precursor of hard drive failure. The sensitive components of hard drives can be seriously damaged by high temperatures with risks including burned circuit boards as just one example. Other issues like system crashes can arise, but most important is the fact you could lose all your data if the drive is corrupted with bad sectors and can’t be accessed—especially if you don’t have a data backup plan in place. According to recent studies, hard drives have a steady decline in average lifespan over time with the largest drop offs between year 3 and 4. If these numbers are extended beyond year 4 of a hard drive’s life, the projected estimates would show roughly 50% of hard drives failing after year 6. There are always outliers like malware and heat damage causing early failure while maintenance and a little bit of luck can extend lifespans, but what’s important to note is based on this data’s trend, as a whole all hard drive life expediencies eventually reach 0%. Check Ventilation: First check that your drive/device has access to sufficient ventilation and has working cooling systems. If drives temporarily overheat from lack of air, the data on the device will still be able to be read once the drive has cooled. Back Up Immediately: If you haven’t already, backup all data in case symptoms grow worse of the drive is damaged. Common backup methods include creating backup copies using cloud storage, document management systems, or a second hard drive. 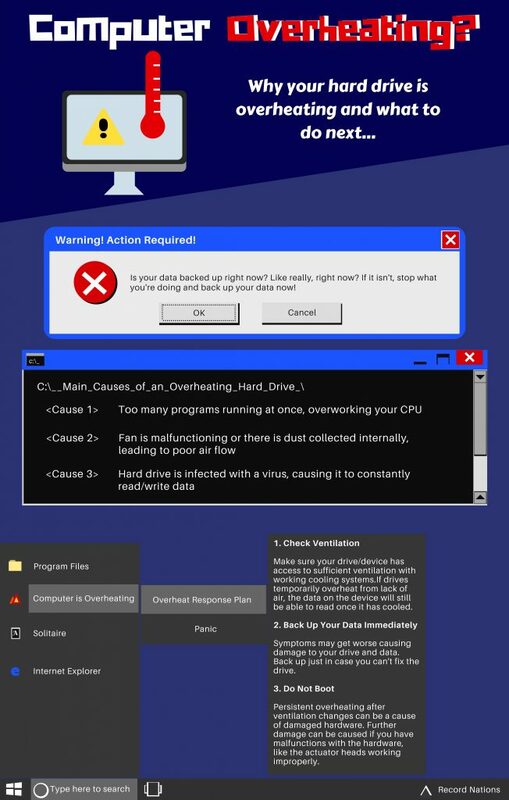 Don’t Boot: If you recognize any other overheating symptoms or it persists after ventilation changes, do not boot up the drive. These issues can be caused by malfunctions with hardware like actuator heads, and trying to either repair or boot the drive can cause further media damage. When overheat damage is so severe that the hard drive is inaccessible or unusable, there’s still a way to recover the data that hasn’t been backed up already. Hard drive recovery services are available as a last-ditch option for a failed hard drive. Many services use ISO cleanrooms to safely repair or replace damaged hardware, and to restore read/write access to the drive providers can also use firmware microcode equipment. Hard Drive Overheating or Need Recovery? Get help and information on creating backups using cloud storage and DMS systems as well as hard drive recovery services. Call Record Nations at (866) 385-3706 or fill out the form on the right for free quotes on services from local professionals. We will help you protect your data.